Sculpture as a rule always presents beautifully in Frank Lloyd Wright’s temple of non-objective art on Fifth Avenue. One has only to recall 2004’s stunning Constantin Brancusi show. Choices is no exception. The present exhibition shows to great effect one of the leading American artists of his day, who passed away only last December, mere weeks before the monographic exhibition opened at the Guggenheim this February. Chamberlain’s artistic alchemy magically combined elements of Abstract Expressionism, Pop and Minimalism, and spawned imitators, but no equals. I remember while growing up in the Midwest in the 1970s seemingly being surrounded by shiny automobile bumper sculptures of hippos, horses, and the like. Thankfully, years later I discovered the work of the master of the found automobile part (and other materials as is well demonstrated in the show) and began to appreciate the abstracted power and thrust of Chamberlain’s sculpture. 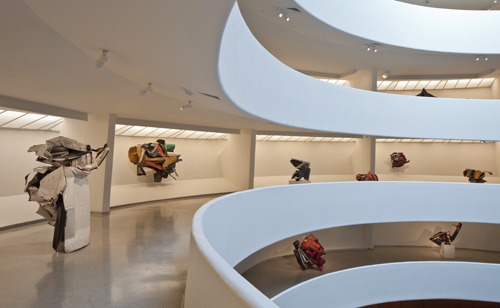 The Guggenheim’s present endeavor—his last exhibition there was in 1971—is not only major monographic treatment and the opportunity for a reappraisal, but the present generation’s opportunity to discover for themselves an artist of tremendous gifts. As a result, today’s viewer will be amply prepared to separate the wheat from the chaff; the truly great from those many sculptors working in a comforting vernacular, the likes of which litter the contemporary American landscape. That said, within Choices itself there is chaff to sift from the wheat, and while the survey opens with a magnificent bang, unfortunately it ends with something of a whimper. The graceful installation winds upwards in a spiral, climbing Wright’s ramp, and allows one to encounter both large and smaller sculptures in the round, often times without pedestals to mitigate their impact or their surprising sense of intimacy. The effect is delightful. The pace and layout of the exhibition invites discovery and engagement with each work. This is a model for such an exhibition and beautifully enlivens the sometimes overwhelming architectural setting (see below right). 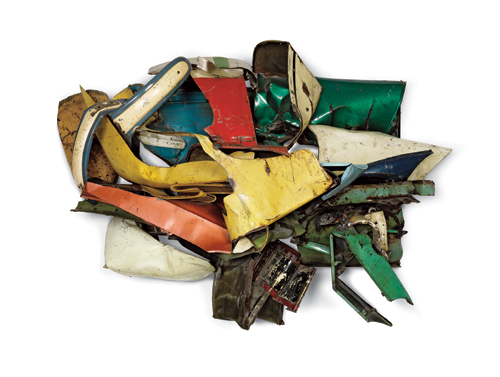 Chamberlain’s homage to American car culture is obvious and is what makes his work particularly appealing to our audiences. And it is completely in sync with the rise of Pop and its practitioners such as Ed Ruscha and Robert Indiana: their reverence for Route 66 and “the Road.” However, by the later 1970s, when Chamberlain returns to employing car parts, he begins to embellish the car parts and their original paint, with drips, spray-painted tags, and gestural brushwork. Leaving his James Rosenquist-like Pop palette of fancy paint jobs and chrome, his work become fussier, less authoritative. In fairness, Chamberlain points the way to (or participates in) the ‘80s aesthetic zeitgeist of street art, pastel colors and signals Frank Stella’s exuberant, colorful compositions of that decade that seem to spring off the wall. So 1982’s Dooms Day Flotilla makes a powerful case that Chamberlain continued to rise to the occasion with great individual works, while as a whole the body of work seems less commanding. The fussiness of the painted surfaces in the ‘70s and ‘80s is paralleled by an enrichment—an over elaboration—of metal parts and pieces. The artist increasingly used, for example, narrow twisted ribbons of steel, so precious that the catalogue compares this to Renaissance drapery studies. As one progresses up the ramp in the chronological installation, it is hard to escape the feeling of diminishment towards its conclusion, an end foretold by the monumental, and I’m afraid, insipid aluminum “wishbone” of a sculpture–SPHINXGRIN TWO from 2010 installed at the beginning of the exhibition. But perhaps it is because the late work was blown-up—along with numerous other small scale sculpture originally from the mid-‘80s—and just doesn’t translate in scale. Be that as it may, the galvanized metal sculptures and the works in other media (like plastic!) of the ‘60s and ‘70s demonstrate the artist’s marvelous inventiveness. Possibly the most surprising –at least for me—are the wadded-up paper bag and watercolor sculptures frozen in resin (like Penthouse 50, see below left) and the terrific (and fragile) cord and urethane foam pieces. 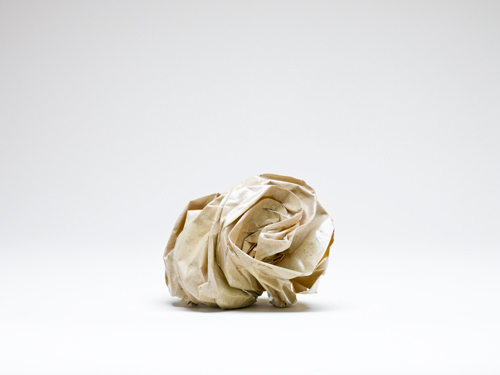 They are different statements in the same vein as Claes Oldenburg’s soft sculptures or zany faux retail goods sold at The Store in 1961, or Christo’s wrapped objects and packages from around the same time. These artistic investigations perfectly reflect Chamberlain’s variousness and innovation, and show him, as has been said by others, someone at the center of things yet on the periphery; completely his own man, but an artist’s artist. If you miss Choices in New York, a version of the show will be held at the Guggenheim Bilbao starting in March 2013. Cool, cool, cool. Very good looking too!